Oh, I just noticed the video too and had a watch. It looks pretty cool. It seems that when you jump off the horse, though, he falls a bit too far before landing back on it's back. He's sort of beside it when it finally catches and he goes back into the sitting animation. Make it happen a bit sooner. I like the look of some of the newer enemies and obstacles coming up I'd like to see the background environment vary quite a bit over the course of the game too, to help the player feel a sense of adventure and accomplishment. Oh, I just noticed the video too and had a watch. It looks pretty cool. It seems that when you jump off the horse, though, he falls a bit too far before landing back on it's back. LazyCow pointed this out too. Thanks to you two, This is now fixed. I'd like to see the background environment vary quite a bit over the course of the game too, to help the player feel a sense of adventure and accomplishment. The plan is to do six levels (it's a very small game! ), spread over three environments. Enemies and obstacles will also be introduced through the course of the game. Looks really nice, I love the colors! how come the turban wearing, pointed shoe, firball wielding goblin is on a cloud. wouldnt a magic carpet fit more with his outfit. I feel like I'm not stuck regarding the combat anymore. It's starting to come together as of today. I mentioned the goblin magicians, which fire high / low fireballs. Complimenting those are new mounted archers, which fire in high arcs that can be dodged by moving forward / back. its all looking good. i would be careful, as of now your using 3 letter keys and two directional ones. for this kind of design it seems like the conrtols might be getting complicated. it might be better to see if you can combine some stuff. perhaps the horse jump gives you a burst of speed so you can dodge the arrows that way or even the joust makes you run faster. or holding the horse jump button allows you to jump off the horse. I think that the controls should reflect the streamlined design you have. also will all horses be white, or will you randomly choose those too? P.s. why a magician? why didnt you do a witch on a broom? This game looks fun. I would definitely swap the lance for a sword if you stick with the timing-based attacking. Also yes, some level of horse customization would be sweet. I'll be redundant, and say that this looks like fun too! Sparky, are you doing anything for music? I'll send you an email. i would be careful, as of now your using 3 letter keys and two directional ones. for this kind of design it seems like the conrtols might be getting complicated. it might be better to see if you can combine some stuff. Yes, absolutely. Actually I am a bit uncomfortable with having three buttons. You make some good suggestions. I really like your idea of combining 'speed up' with 'attack'. I think I might do that. One other thing I might do (assuming a three button design) is move horse jump to the up arrow. That would feel simpler, I think- horse with right hand, knight with left (though I really don't like jumping with the arrow keys). I'm playing with a couple of tans and browns, which might be randomly swapped for some of the goblin horses. The hero's horse will always be white. I would definitely swap the lance for a sword if you stick with the timing-based attacking. Yeah, I think that would be the way to go. I kind of want a high / low attack system with enemies holding shields, but I don't want to clutter the game up so I'm currently leaning toward a timing-based attack. here this article might help a bit with the controls. Many people have a misconception that goblins are dirty because they wear the same clothes for extended periods of time. This is not true. Goblins (especially the purple variety) are extremely finnicky about hygeine. Not only are their clothes always immaculate- their passion for cleanliness extends to their taste in landscaping. So abhorrent is dirt to the purple goblin that every last speck of dust has been removed from their homelands with tweezers; nothing but bedrock remains. I'm considering falling boulders which are screen-relative- they would force a speed change the same way archers do. The downside: my Moon Patrol complex doesn't like them because they're too similar to said game's flying saucers. Hiya sparky! Just want to wish you good luck with this! Looks outstanding! why dont you switch to flaming boulders shot from catapaults which the goblins have hidden (rather cleverly) off screen. also why 11:7 why not just 16:9 and do widescreen. TIN CAN KNIGHT: WIDESCREEN DIRECTORS CUT! Oh yes, there's a rather good chance they will be flaming. So, it's been awhile since an update. How's development been going? and while I'm at it-how's Star Guard shaping up? Still in beta? Oh man, this is so cool. Sparky, you rule. Oh wow...this brought back some really nostalgic memories of playing Advanced Dungeons & Dragons: Hillsfar on the PC. I had forgotten all about that game! Man, I played the crap out of it. This is totally like the horseback riding mini-game you play when going between areas in the world. Anyone else remember playing this? 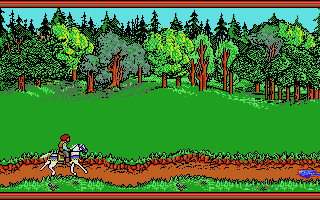 Instead of being plopped down in the middle of a monster-infested countryside, you're given a horse and are put on the road to the city of Hillsfar. You must guide the horse down the obstacle-strewn road using your joystick to speed up, slow down, duck under low-flying birds, and jump over obstacles like puddles and tree stumps. Thank you so much for bringing back great gaming memories.